The focuser is a 2 inch. Edited by Darren Drake, 02 November 2018 - 08:16 AM. That's just like the one I've got. Nice mount, would that be an Al Novak mount? Yes it's a Novak mount. What size is the shafts? Looks like smaller than the 1.5" on mine. Ken made several different mounts. Edited by Jeff B1, 02 November 2018 - 04:55 PM. Edited by Darren Drake, 02 November 2018 - 05:15 PM. It looks like 1" shafts. I was going to get Danny to turn my 16" mirror into an f/50 Classical Cassegrain but did a Newtonian instead. Now, I have dissembled the telescope and stored it away because I just couldn't climb the ladder anymore. Just thinking that I would still be observing Mars sitting under that Cass. However, he must have felt good the day he figured my 16" because everyone that used it says it is the very best ever. 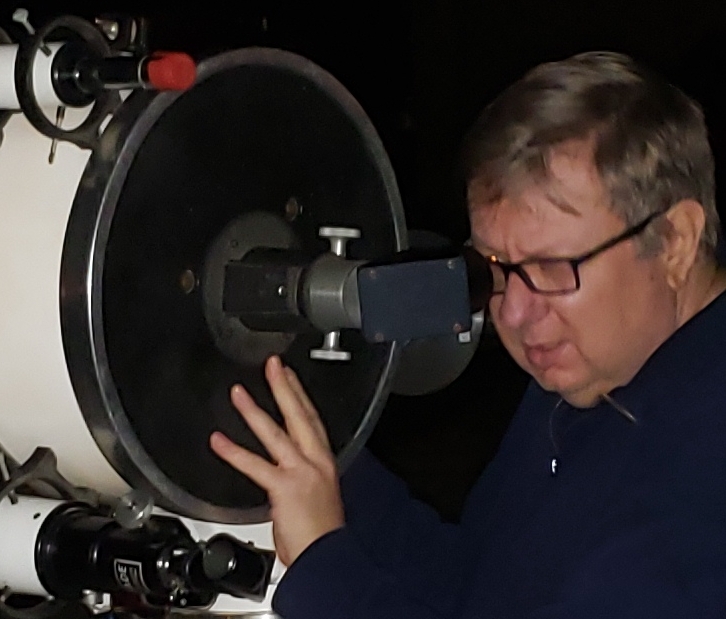 my 12.5" f/30 was figured by Richard Fagin and Danny hated him, but it was an excellent telescope. Once I finished replacing the fiberglass tube and other stuff. Parker and I observed comets with it at absurd magnifications. Back in 1982 we observed comet Austin at 500x because it was a very close object and at high mags we could almost see it passing stars. I would regularly observed Mars at 500-900x. Edited by Jeff B1, 02 November 2018 - 06:25 PM. Well if Dan did it i know it is good. I had his 8" F/6.7 mirror years back and it was sharp as a tack. Not sure i want to deal setting that heavy OTA up on it's mount, but would love to have it. Nice looking scopes, thanks for sharing. Back in the day I didn't become aware of the Novak/Chicago mount until they were no longer available. I saw one at Astro Fest south of Chicago and thought they were a nice basic mount. I met Ken Wolf, in 1980, he was retired at the time and lived not far from me Rock Falls, Il. I made a 6" mirror in 1970 at the Adler optical shop, when Ken Wolf was running it. and visibility unlimited) and I'm leaving to go flying." Darren, when designing my Cass it took me pounds of paper and PC programming to get it right. Looks like you spent lots of time on paper as well. I had some experience with small Newtonians and RR's, but the Classical Cass was intriguing, so I started off large Well, 12.5" was large then. I found some mistakes in Novak's "Cassegrain Notes" and it took some fiddling to find the answers and correct some of my design; especially the baffles. Then I used the conventional wisdom for the time and used materials that caused problems. After many talks with Bob Cox and others I replaced the tube and put fans in and other stuff that made the scope work very well. The last problem was heat plums from the secondary that I accidental found the cure for; I had used a steel wire with clip to stabilize the tube while working on it, clipped it to the spider and happened to see that the plumes were almost gone. After attaching clips and wire to the ends of the spider all the heat problems were gone. Parker laughed at it so I engineering a better way. Edited by Jeff B1, 03 November 2018 - 04:38 AM. While searching for some old photos of my 12.5” f/30 Cass I found one of the focuser with a vernier dial and pointer. Hum, then I remembered that it was for Parker to photograph some planets and we recorded the dial settings so I could better focus while taking pictures! While focusing the telescope for visual work was okay, my astigmatism hampered my camera work so the dial cured that. Fooling around ATM’ing was a lot of fun. Edited by Jeff B1, 03 November 2018 - 06:06 AM. I don't see how you can find anything at F/30. Power must be 120x with a 32mm Eyepiece. Huh. Well, observing Mars I always started at 500x and worked up to an acceptable mag. Even 300x on Saturn was nice. Edited by Jeff B1, 03 November 2018 - 08:00 AM. Edited by starman876, 03 November 2018 - 09:01 AM. I don't really use finders anymore. Only to help add back weight if i am forced to. My 5" F/12 D&G points so easy i never need to use a finder. But at 12.5" scope at F/30 can't have a very wide FOV so that would be hard without a finder. 500X i am just getting warmed up in 12.5" if it has super optics. 800x is more like it . I had no problems using 800x on Saturn with a OMI 12.5" Obsession. The first primary had a bit of a zone, but not bad enough to throw me off much. The second was very close to perfect. In 1982 Parker and I used it to observe comet Austin; a really close and fast guy. We just started increasing magnification so we could see it moving by stars, just barely sensed movement, and without realizing it, we ended up at 3,000X !!!! Well, it got kind of empty, but still yet we could see the comet and blobs for stars. You're just a one man go-to. I just find objects in a diff way from others. I go from Deep sky object to object without star hopping. Case in point. when viewing M15 i use M15 to find M2,by moving the scope south and a tiny bit to the east. Same for M13 to M92. i move northeast of M13 to find M92. Kinda like moving a hair north north east from M42 to find M78. I cannot imagine increasing the magnification until things are just blobs. To each his own I guess. But empty magnification is useless. Edited by Jeff B1, 03 November 2018 - 04:40 PM.